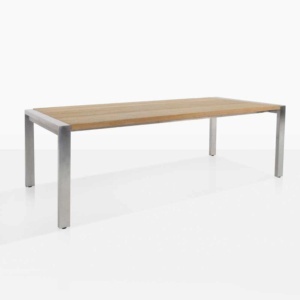 Bring state of the art, elegant furniture to your home with the Stainless Steel and Teak Plank Table and Bench Set. This stainless steel and teak dining set adds modern splendor to any area it graces. 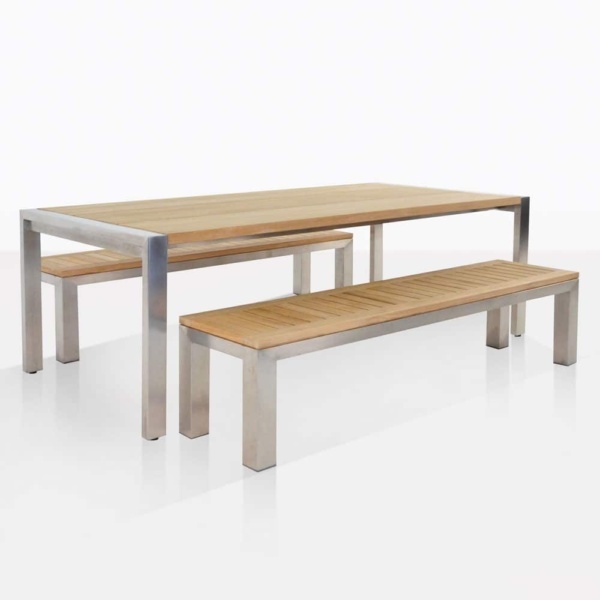 Bring state of the art, elegant furniture to your home with the Stainless Steel and Teak Plank Table and Bench Set. This stainless steel and teak dining set adds modern splendor to any area it graces. Bring state of the art, elegant furniture to your home with the Stainless Steel and Teak Plank Table and Bench Set. This stainless steel and teak dining set adds modern splendor to any area it graces. 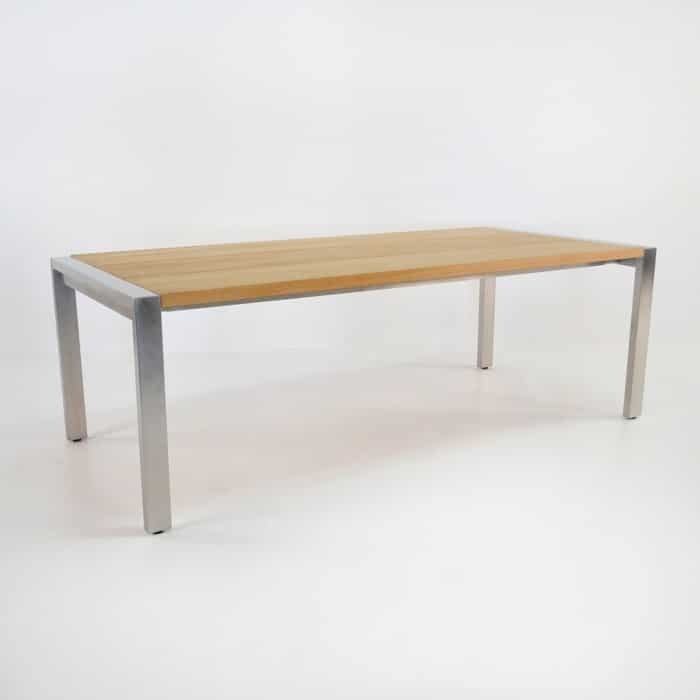 Modern because of the amazing harmony between the two predominant materials within the Plank Table and Stainless Steel Benches.The Plank Table, here at 2.4 metres long, is made with #316 Stainless Steel legs and beautiful, unique 13 inch thick planks of solid Grade A Teak. 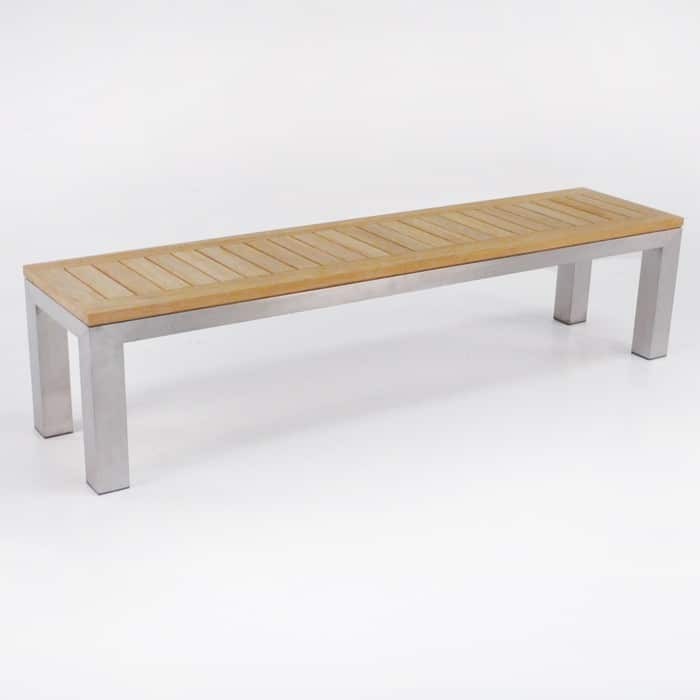 The benches too, is an amalgamation of steel legs and teak top. The overall look is very, very chic. Grade A Teak is the creme de la creme of woods for outdoor use, expertly kilned, its naturally generated oil content makes it last for longer, while providing joy to your eye and touch with its stunning grain and smooth finish. While the stainless steel, being #316, will not rust or lose its beauty being outdoors! This stainless steel and teak dining set will part of your outdoor dining experience for years to come! At Design Warehouse, we cater to those who want top quality, long lasting and on trend outdoor furniture. All of our products are quality tested and are marine grade. We also carry a wonderful range of all weather wicker products, plasteak and mesh. So whatever you need to assist you in creating the best outdoor living space that suits your personality and style, we can help. Call us. Email us. Inquire online. Come into the store. Design Warehouse is open 7 days a week, and our sales staff are ready and willing to help your vision become a reality. This stainless steel and teak dining set is just one of many dining set ideas available. 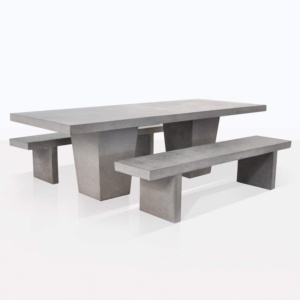 Each piece is sold separately, so you can try this table with our Raw Concrete Bench or perhaps one of our Batyline® and Stainless Steel chairs, to add another texture to this already superb design. Perhaps you have a rooftop deck that is perfect for long dinner parties? Place the Stainless Steel and Teak Plank Table and Bench Set in one corner of your space, fix one of our incredible cantilever Sunbrella® umbrellas to an opposite corner and enjoy the grandeur of amazing furniture outdoors. Did you know Design Warehouse arranges delivery all over the country (and beyond?) We arrange competitive quotes from third parties so that you get the best possible service. So whether you’re in the Coromandel or Invercargill, ask us for a quote. We are happy to help! 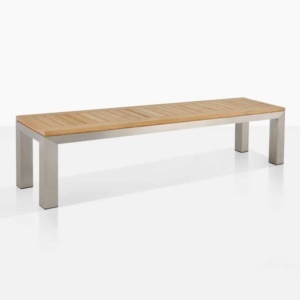 The Stainless Steel and Teak Plank Table and Bench Set is ready to be shipped to you! Call us today!